The 2017 edition of JgC was the largest event of its type held in Japan, attracting delegates from both local and international markets. Clarion Gaming has confirmed increased support for the event in 2018 with major sponsors including Galaxy Entertainment, Melco Resorts Entertainment, MGM Resorts, SJM Holdings Macau, Transact, JCM Global, Hard Rock, Caesars Entertainment, Clairvest, Konami and more. Caesars Entertainment President and CEO, MarkFrissora was in Osaka and held a meeting with Governor Ichiro Matsui and Mayor Hirofumi Yoshimura. Caesars became an Official Partner with Osaka in its bid to host the 2025 World Expo in Yumeshima, next to the planned site for the major IR. The meeting with the governor and the expo sponsorship demonstrated Caesars’ strong intention to bid for the Yumeshima site. Caesars is, in fact, the fourth international IR operator to become Osaka’s Official Partner on the expo bid, following Melco, MGM, and Hard Rock. 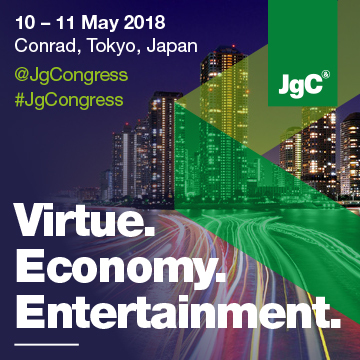 Gaming organisations, targeting the significant business opportunities in the emergent Japanese integrated resort sector, are encouraged to participate at this year’s Japan Gaming Congress. Japan Gaming Congress 2018 will focus on a variety of topics, including updates to the much anticipated legislation including bills related to ‘Problem Gaming’ and general IR regulation which are estimated to be announced during 2018. In addition to these tracks, the event will look at setting realistic expectations on the positive impact an IR will have on the local communities. What is the global perspective?